I am both a nerd girl and a nature girl. I was swept away along with all the other kids in 1969 when American astronauts landed on the moon. I remember eating the astronaut breakfast bars, drinking the astronaut Tang, and lusting after the astronaut pens. My mother was a Trekkie and we would watch every episode of Star Trek as a family to get our fix of what a wonderful future we had in front of us. I also remember watching the movie Silent Running directed by Douglas Trumbull only three years later. I was nine years old. As a nerd girl I spent a lot of time by myself. Frequently I would walk out to where I could sit in nature, watch the animals, and scribble in my journal. I wrote down poems, personal thoughts, and bad Lion, Witch and the Wardrobe fan fiction. My other family became those plants and animals I bonded with in my after school time. Silent Running hit me hard. I was sympathetic with both the robots and the last Earthly ecosystem adrift in space. The protagonist was an upsetting but understandable figure, trying to rescue Earth’s other children with the help of his little robot friends. 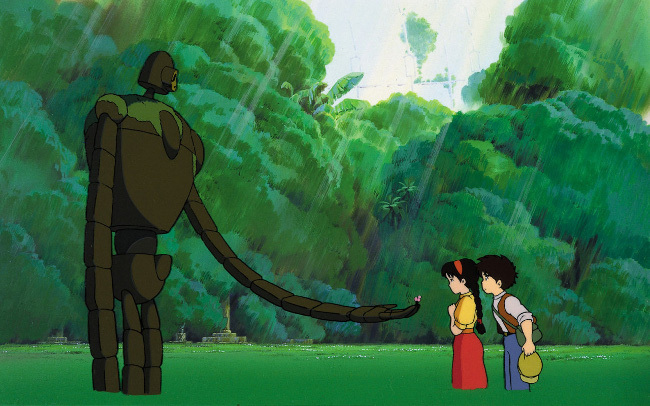 In the 1980s I watched the equally moving film Laputa: Castle in the Sky directed by Hayao Miyazaki. In this film we also have a robot whose purpose is to protect the wildlife on its floating island. The most iconic scene from that film is when the robot offers the child Sheeta a flower. Right now our living world is in grave danger from the fall out of Global Climate Change. People talk about how jobs are disappearing due to the rise of robotics. However, I keep thinking that this must mean we have more people with more time to help rehabilitate the planet. Even so, we need help to do as much as we can as quickly as we can. Surely, we have people who would relish the chance to create robots like those in Silent Running and Laputa to help rescue the natural world? 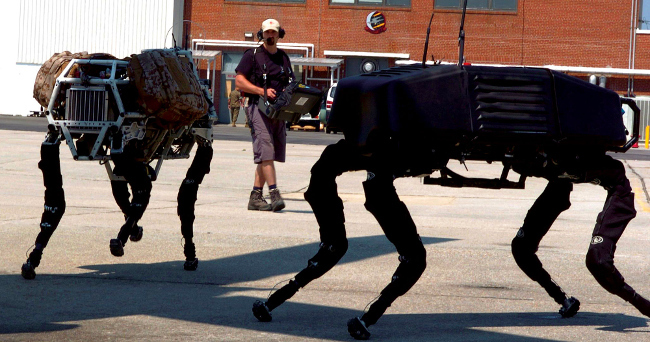 When I see news about “cool” new robots for military applications such as these “dogs”, I feel chilled to the bone. I find them terrifying and a complete waste of human intellect. We can be so much better than this. Where are the builders of appropriate technology? Where are the builders of inspirational technology? Where are the builders for creating a bright new world where economies and starvation are a thing of the past, and a lush world teaming with life is still possible? Don’t for one moment throw at me the names of millionaires and billionaires whose egos are larger than their genuine green credentials. They are not the future. We are the future: just like in Star Trek. So who is going to start building these robots? Please start straight away. We need you. Robots that clean up the space debris circling around in the Earth’s upper atmosphere. Robots that clean up the Great Pacific Garbage Patch. Robots whereby endangered animals can be protected from poachers. Please help me add to this list!